Apple today updated its official list of vintage and obsolete products to add the second-generation Apple TV, originally released in 2010. 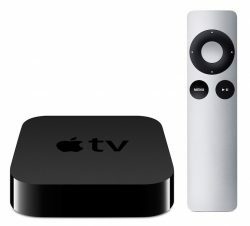 The second-generation Apple TV was the first Apple TV that featured a black body and an aluminum Apple Remote, an updated look compared to the silver and white Apple TV that was originally released in 2007. Apple sold the second-generation Apple TV from September of 2010 until 2012, which is when the company released the third-generation Apple TV with an A5 chip and support for 1080p content. The second-generation Apple TV is now classified as "vintage" in the United States and Turkey and "obsolete" in the rest of the world. Vintage products are those that have not been manufactured for more than 5 and less than 7 years ago, while obsolete products are those that were discontinued more than 7 years ago. Both classifications essentially mean Apple is no longer providing hardware service for the device except in Turkey and California, where local statutes require that Apple continue to provide service and parts for a longer period of time. They might as well obsolete the third-gen Apple TV while they're at it. You know that won't likely be receiving any meaningful updates going forward. Oh crap! Another $100.00 device that's becoming a paperweight. And only seven years after it was introduced. They can also add the 4th gen too, since it doesn't even support 4K. Don't rrush innovation, Apple! Mine's still going strong. It's also very easy to jailbreak, which allows it to keep up with more current needs. Can't tell if that's sarcasm, but my ATV v1 is still going strong, as is my ATV v2. Unless they do something to make them completely incompatible with the apple ecosystem, I see no reason they would become paperweights any time soon. They still work. 7 years is a good run for a product, and good to see the TV2 supported for that long. It definitely wasn't supported for that long though. Apple TV 2 hasn't seen updates since 2014, it never got the flat UI, YouTube stopped working. It has essentially been an airplay box with 720p Netflix for 2 1/2 years. I'm not that mad about it but to act like apple just stopped support in march 2017 is misleading. Yeah Apple TV needs to be replaced with something that also has a mic and speaker for home automation and they really need to kick up Homekit adoption even if it means making accessories themselves that are reasonably priced. My money to purchase is obsolete. I disagree. I think the ATV 4th gen will continue to be supported for a long time -- much like the iPad 2 was. I think it will be sold as the entry-level ATV when the next-gen ATV is released. It's perfect for people (like myself) that have 1080p TVs and don't have any desire to upgrade them anytime soon.